Hey kids! Who wants to read a book about a bureaucrat? No takers? Ah, shucks. That’s basically what you have with Authority, which is the second book of Jeff Vandermeer’s ‘Southern Reach’ trilogy. Annihilation had a creepy, cold, Lovecraftian vibe, and to me the book was about maintaining that ‘New Weird’ mood—rather than building vibrant characterization, or in providing concrete answers on what exactly is happening at Area X, and what’s causing it. In my mind, the novel, which is narrated as the journal of an aloof and emotionally scarred scientist, actually suffers if it shows too much characterization—or explains too much of the enigma at its core. Not surprisingly, a lot of readers seem to disagree with my assessment, and I’ve seen lots of criticism that the book was too ‘thin’ on clarity and emotional investment in the characters. If you had those complaints about the Annihilation, you might be happy to find out that Book 2 is clearly a change-up in style. Unfortunately for me, this wasn’t an improvement. 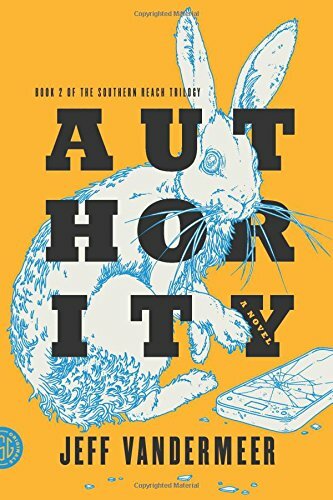 Instead of learning more about what’s happening in Area X, the reader is taken inside the inner workings of the Southern Reach organization. You’ll get a few answers about what these shady folks have been up to, but once again, this is one mystery that gets duller when you pull the shady figures out of the shade. The inner circle of the Southern Reach is made up of bureaucrats in failing careers, vying for interdepartmental power in an outdated and deteriorating arm of the government. Book 1, for all its detached atmospherics, was a tense survivalist tale in a beautiful and deadly landscape. The tone of Book 2 is much more straightforward, but most of the conflict is centered on office politics. Not exactly the most exciting setting. That’s not to say that Vandermeer doesn’t use the shabby banality of janitor’s closets, old VHS recorders, and overstuffed filing cabinets to create some genuinely creepy moments. Sometimes reading the book I was reminded of some scary scenes from Silent Hill. The employees of the Southern Reach have been ‘gazing into the abyss’ for a long time. They’re cracking up, and the creepiness of Area X is seeping through those cracks. What exactly is Area X? Who or what caused it? It becomes fairly obvious early into the book that no one in the Southern Reach knows. So how can this book move the trilogy along? It can’t. And despite the creepy fun, there aren’t many ‘significant developments’ in Authority. Not until the last 20% of the book. That’s when the plot picks up, and we start to see more of Area X again. Was that last bit of plot development enough to keep me going, to finish read the trilogy? Despite my disappointment in this particular volume, I’ll have to admit that Vandermeer’s ideas and writing style are keeping me intrigued. Maybe that’s why Book 3 is entitled Acceptance. I’ll have to accept the fact that he’s already hooked me in for that last $9.99. No! Don’t stop on part II. Move to III right now. It’s far far better and way cooler. Good to know! Yes I really enjoyed Part 1, so I will probably give the third one a try. I don’t even care if they explain the Area X phenomenon, as long as we find out what’s (really) happening with the biologist.